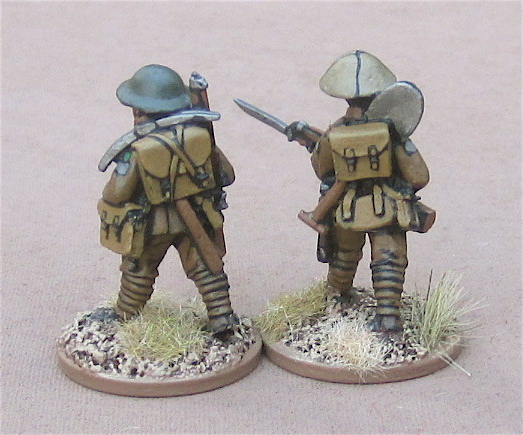 Now that I have samples painted of (insofar as I know) every manufacturer of Great War British (late war) infantry (which I am of course using as Canadians) I thought I’d post some figure comparison pictures – because many miniature gamers are very concerned about such things. I’m not as concerned as others… )although I did recently pick up some 6mm Sci Fi infantry I thought I might use as proxy Imperial Guardsmen and though they are lovely figures, they are taller than the GW Space Marines that I have… so… I’m not so sure I’ll be using them…). 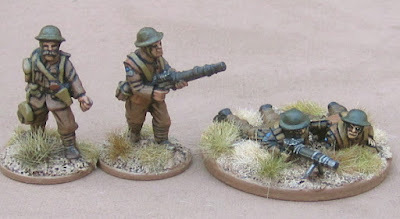 There is at least one other manufacturer of Great War British that I can think of – but in that particular case they only do early war (the the SD caps) and were of no use to me. I have also included the Great War Canadian figures that I modelled, moulded and cast myself - just for interests sake. Officers (from left to right): Scarab Miniatures, one of my own, Renegade Miniatures, Gripping Beast/Woodbine Design, 1st Corps, Renegade Miniatures, Great War Miniature, Brigade Games, Old Glory, Irregular Miniatures, and Wargames Foundry. 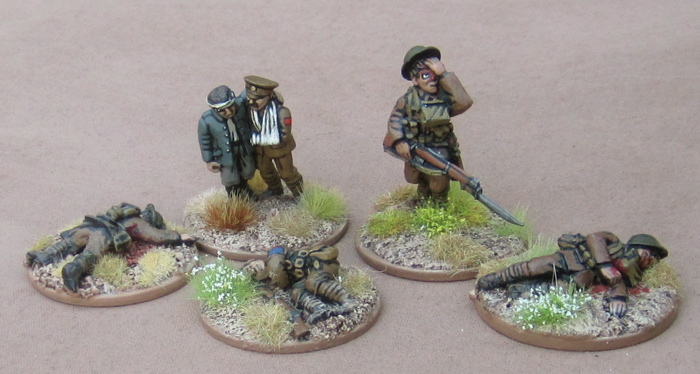 I don't actually have any UNITS of Great War British (or Canadians) by Scarab Miniatures, but I do have the one pack of officers, so I thought I'd include him in the line-up. Lewis Gunners (from left to right): Renegade Miniatures, one of my own, Great War Miniatures, 1st Corps, Brigade Games, Gripping Beast/Woodbine Design, Old Glory, Wargames Foundry, and Irregular Miniatures. Most manufacturers also make a No.2 or Loader for the Lewis Gun. From left to right-ish we have Great War Miniatures, 1st Corps (slightly behind), Brigade Games (in the middle up front), Renegade Miniatures (in the middle at the back), Gripping Beast/Woodbine Design, and Wargames Foundry. Like, say, Brigade Games... Their packs include one team advancing and one that is prone and firing. I could be a little more forgiving if their other packs included figures that are kneeling... but then don't. They don't even include any other figures that are FIRING!? It's prone firing machine-guns and everyone else is just advancing, like they're on a stroll through the park... and they ain't cheap. At least with Old Glory, they're (relatively) inexpensive and you get a pack of TEN Lewis Gunners - five prone and firing, five that are standing and firing - enough to have one of each available for each unit, depending on whether they are defending or attacking!? What's even worse is that even though they make highlanders - they don't make highlanders with Lewis Guns (or at least didn't at the time, I haven't bothered to go back and check) so I had to convert one out of one of the prone teams!? Bombers (from left to right): one of my own, Renegade Miniatures, Great War Miniatures, Brigade Games, 1st Corps, Gripping Beast/Woodbine Design, Irregular Miniatures, Old Glory, and two from Wargames Foundry. Firing (from left to right): one of my own, Renegade Miniatures, Great War Miniatures, 1st Corps, Gripping Beast/Woodbine Design, Old Glory, Irregular Miniatures, and Wargames Foundry. Brigade Games doesn't seem to have any firing miniatures - well, other than their Lewis Gun team. All of their other miniatures are upright and advancing. Which further makes me wonder WHY they had to include a prone Lewis Gun team!? Advancing (from left to right): one of my own, Renegade Miniatures, Great War Miniatures, 1st Corps, Brigade Games, Gripping Beast/Woodbine Design, Old Glory, Irregular Miniatures, and Wargames Foundry. 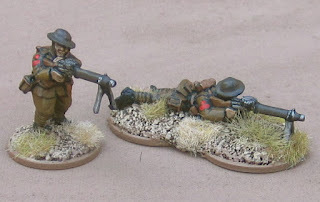 Two advancing figures from Great War Miniatures. People often ask me: "which is your favourite?" I find it hard to pick, I like all of them... well... most of them. I like some things about some, other things about others. This picture above illustrates one of the reasons I think overall I like Great War Miniatures the best - beyond the clean, easy-to-paint details - it's the little extra things like shovels and picks - that you see being carried in pictures of assaulting troops - that give the guys just a little bit of character. I included two from Old Glory because they had one thing that I don't think anyone else had - a rifle grenadier. I also included four from Gripping Beast/Woodbine Design because... well... because they HAD a lot of different poses - all of which I though were great. I did take a separate picture of the different highlanders I have from some of the manufacturers, but then realized I didn't have examples of all the ones I own - Brigade Games was missing - and I don't even have highlanders from some of the manufacturers that produce them, so I decided to not include it at this time. Earlier I did a comparison of Great War Vickers Teams. The rest of 6th Brigade.